Gingivitis is a common oral health issue that affects millions of people here in the United States. Gums that are red, irritated, swollen, tender, and/or bleed easily are most often affected by gingivitis. It is important to understand that gingivitis is treatable – but only in its earliest stages. Once gingivitis turns into more serious periodontitis, it will cause irreversible damage. It is essential that you take gingivitis seriously because it can lead to serious consequences, including tooth loss. The most important thing to know about gingivitis is that it is entirely preventable. The main cause of gingivitis is poor oral hygiene – something only you have control over. While brushing your teeth at least twice a day is crucial to keeping your mouth healthy, flossing is the most important oral hygiene habit – yet it is the most neglected. Floss is the only tool designed to remove plaque at the gum line and from between the teeth. When plaque builds up at the gum line, the bacteria that form plaque begin producing a large amount of acids that eat away at the tooth enamel and gum tissues. This irritation will lead to an infection that causes the gums to become damaged. Your dentist can easily help treat gingivitis in its earliest stages. A deep cleaning to remove the bacteria laden plaque will give the teeth and gums a fresh start, and a microbial antibiotic mouthwash can help heal the gums. However, for this treatment to truly be effective, patients must be committed to making necessary changes to their oral health routine at home. As with any habit, the more you choose to floss your teeth, the more easily the habit becomes. Flossing your teeth before you brush them each night helps to loosen food particles and bacteria from the teeth so that they are easily brushed and rinsed away. It is also important to keep regular dental appointments for cleanings and checkups. Those who are more prone to gingivitis or who have risk factors that increase their chance for developing gingivitis should see the dentist for for dental cleanings more often. At Gold Hill Dentistry, we are here to help you achieve and maintain the healthiest smile possible. If you have any signs of gingivitis, please do not ignore them. 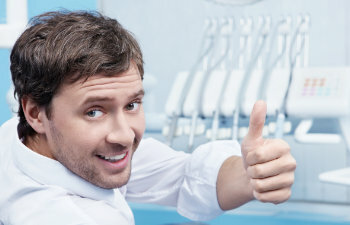 We are here to help clean your teeth and gums so that they can benefit you for your entire life. Call today to schedule an appointment.